Kerry Villanueva, Mustang Valley Elementary’s 2016-2017 Teacher of the Year, was in elementary school when the thought of being a teacher crossed her mind. School was so much fun, she never wanted it to end. She’s been a teacher for 17 years and is in her fourth year at Valley. Villanueva said Mrs. Catherwood, her second grade teacher, did projects with melted crayons and turned sugar cubes and icing into igloos. It didn’t hurt that her mother was a reading specialist, her maternal grandmother was a teacher and her father was a professor at OSU. After graduating from Stillwater High School in 1993, she followed her father to Oklahoma State University. She earned a degree in English as well as a K-8 teaching certificate. After graduation, she moved with her husband to Tulsa and taught middle school. A move to Reno, Nevada followed and she taught for five years before moving back to Oklahoma when they had their first son. She taught title reading in third through fifth grade at Putnam City before moving to a second grade class. 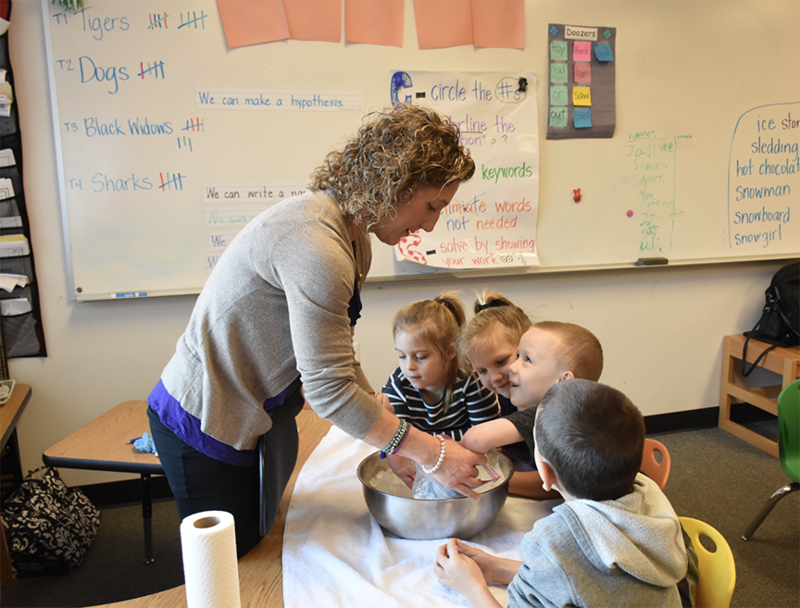 She was back working with students as part of the federal title program when a first grade teacher had to leave in September. The teacher announced she wasn’t coming back in December. The class had been a rotating door for substitutes. When her youngest started kindergarten at Valley Elementary, Villanueva decided she loved the atmosphere of this school as well and applied. This is her fourth year at Valley. She couldn’t imagine being anywhere else. Her class enjoys the benefits of different types of flexible seating, which Villanueva believes helps them stay on task. The class “Elf on the Shelf,” named Syrup brought the first two stability balls the students could use to sit on. The kids loved the seating so much that Villanueva’s mother bought her eight more. She’s using some scholastic funds to purchase disk-shaped cushions that also allow movement to increase the seating options. Villanueva was honored to be chosen as Teacher of the Year. “There are a lot of teachers who would deserve it. It was a big honor to be voted as Teacher of the Year,” she said. “I love being at Valley. I really love my job. Villanueva is one of 14 Teachers of the Year for Mustang Public Schools. A District Teacher of the Year will be announced at a banquet on March 30.